Every day in Houston, 1 out of 4 preschool-aged children may not know where their next meal is coming from. Harris County has the 2nd highest rate of child food insecurity in the nation, meaning many kids have limited access to affordable, nutritious food. Each weekday, Kids' Meals delivers thousands of healthy meals to Houston's hungriest preschool-aged children. Last year, with your help, The Amish Craftsman provided more than 1,200 meals for hungry children! 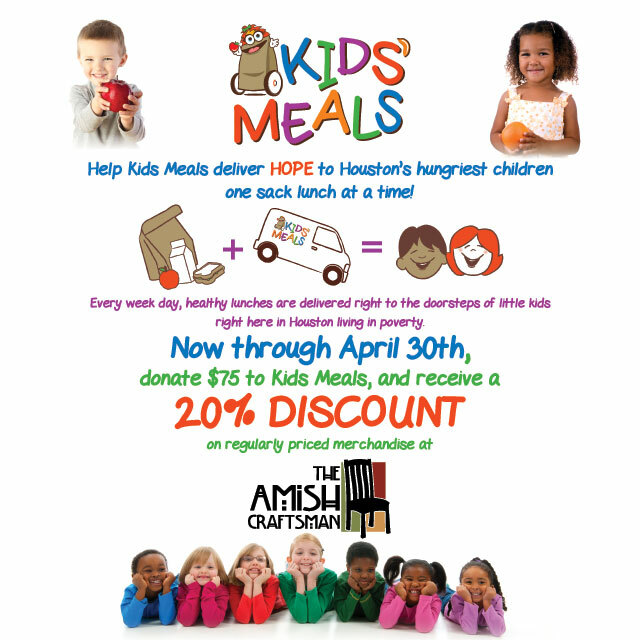 Join us in supporting Kids' Meals and help end childhood hunger here in Houston! Now through April 30th, donate $75 to Kids' Meals and receive a 20% discount on regularly priced merchandise at The Amish Craftsman! Help Kids' Meals deliver hope to Houston's hungriest children, one sack lunch at a time!